Fourth Row Center: Film Writings by Jason Bailey: In Theaters: "Fantastic Mr. Fox"
In Theaters: "Fantastic Mr. Fox"
It’s funny, how effortlessly Wes Anderson’s style clicks and locks into the stop-motion animation world of his latest film, Fantastic Mr. Fox. It shouldn’t come as a surprise; he’s always been a stylist, and his previous pictures (particularly The Royal Tenenbaums and The Life Aquatic) were intricately (some would say obsessively) designed down to the tiniest set and costume details. So it’s not much of a jump to infer that he’s the type of filmmaker who would revel in the opportunity to create his own world from the bottom up. What is unexpected is how easily his dialogue and characterizations work in what is, by any measure, an animated picture aimed at a family audience; the characters may be foxes and opossums and rats and weasels, but they have familiar hopes and dreams and insecurities, and they express all of them in clever, sardonic dialogue. He’s mated his worldview with Roald Dahl’s narrative and come up with a picture that feels absolutely faithful to both. The titular character (voiced by a pitch-perfect George Clooney) is an expert chicken thief, forced to go straight by Mrs. Fox (Meryl Streep) when she announces she’s pregnant with their first child, er, cub. Jump ahead a couple of years; their son Ash (Jason Schawartzman) is going through an awkward stage, made worse by the extended visit of his cousin Kristofferson (Eric Anderson), a likable natural athlete. Mr. Fox is now working as a newspaperman and dreaming of upward mobility (literally); he decided to move his family into an upscale tree, fueled in no small part by its close proximity to three farms with plenty of stuff for the taking. He decides to do one last job—in several parts, he explains. Anderson’s last film, The Darjeeling Limited, was a pleasurable enough diversion, and light as a feather—which was part of its problem. I’d already forgotten it about twenty minutes after leaving the theater. He hasn’t made a bad film yet, but in spite of its exotic locales, Darjeeling felt like the work of a filmmaker trapped in a box, working the same themes and painting with the same palette, and risking typecasting himself (and exclusively serving a steadily dwindling niche audience). Fantastic Mr. Fox is not, to reiterate, that far removed from his wheelhouse, but by turning his filmmaking process upside-down, Anderson seems to have reconnected with the infectious energy and all-out joy of his early pictures. And it’s the funniest thing he’s done since Rushmore; Anderson’s screenplay is co-written with the brilliant Noah Baumbauch (his collaborator on The Life Aquatic and the writer/director of The Squid and the Whale and the criminally underrated 1995 film Kicking and Screaming) and is full of witty wordplay, off-beat exchanges (“That’s just weak songwriting! You wrote a bad song, Petey!”), and clever running bits (I’m particularly fond of Fox’s insistence on “bandit hats,” and the use of “cuss” in place of profanity, as in “what the cuss” and “cuss you”). It’s also full of funny little visual jokes; the compositions are not only striking but frequently amusing, and a scene where Anderson plays out a heist in a single wide shot, on a series of connected security monitors, is a little masterpiece of comic timing. Much credit is also due to the talented crew of stop-motion animators (led by animation director Mark Gustfson); the film was reportedly shot at 12 frames per second, in contrast to the normal 24, which gives the film its distinctively jerky-yet-somehow-fluid look. The effect is stunning without overwhelming the picture; we regard the lovely fur and occasionally watery eyes, but we’re not distracted by them. 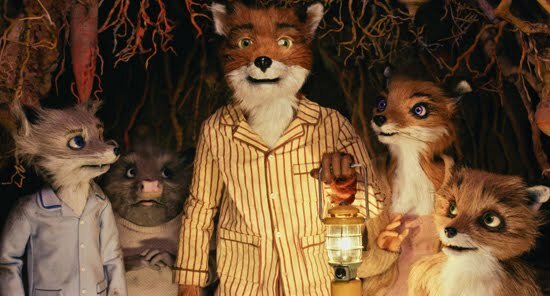 Fantastic Mr. Fox has its flaws; it might be too twee for some tastes, and the second half gets a little stuck in the mechanisms of the plot (it’s not quite as funky and free-wheeling as the set-up sequences). But it’s an absolute charmer, sweet and sunny and unquestionably entertaining—though I wonder what it says about mainstream American filmmaking that the three best pictures of the year thus far (Up, Where the Wild Things Are, and this) are ostensibly made for kids. "Fantastic Mr. Fox" is currently playing in wide release.